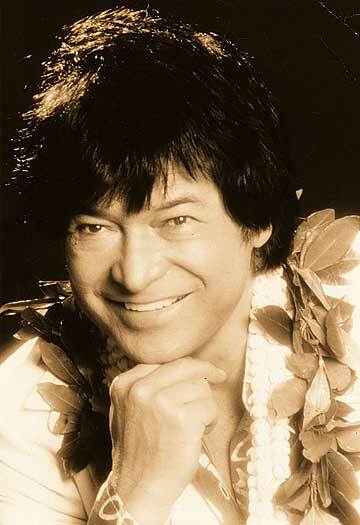 Hawaii has lost one of its most popular attractions with the death of Hawaiian entertainer Don Ho. Promoter-producer Tom Moffatt said he once told a Los Angeles Times reporter, "People who come to Hawaii know three things -- Diamond Head, Pearl Harbor and Don Ho. "His name is synonymous with Hawaii." Ho died yesterday morning at the Queen's Medical Center of heart failure at age 76. Ho, famous for his hit songs "Tiny Bubbles" and "I'll Remember You," played to capacity crowds in Waikiki for more than 40 years with a signature "Ain't No Big Thing" style. He underwent experimental stem cell treatment for a weakened heart muscle in December 2005 in Thailand but was back on the stage at the Beachcomber in January last year for twice-a-week shows. "He had a gift. He had magic," said longtime columnist Eddie Sherman. "He was really (Hawaii's) ambassador of modern times," Sherman said. "If anybody mentioned Hawaii in any way, shape or form, the next words were 'Don Ho.' "
Ho is survived by his wife Haumea and 10 children. Moffatt, who was at Thursday's performance, said Ho got a standing ovation when he left the stage for the last time. Don Ho's web site, www.donho.com, was still being reformatted late yesterday so that fans can leave comments and tributes to the singer. But the "contact us" link on the Web site connects to Ho's MySpace page, and messages can also be left there.